This area contains Bow Brickhill Park and Heath, running south to the end of the Greensand Ridge and through the acid grassland foothills around Little and Great Brickhill to the Ouzel Valley. The BOA connects to the Bedfordshire Heathland Opportunity Area. 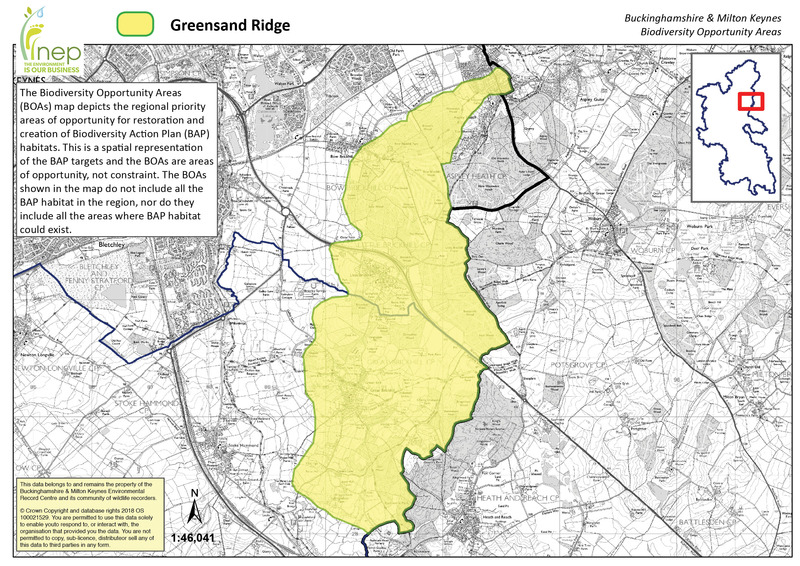 Joint Character Area: Bedfordshire Greensand Ridge (partially also Bedfordshire & Cambridgeshire Claylands). Landscape Types: Wooded agricultural landscape with areas of heathland. The southern end is agricultural with dispersed woodland. Geology: Mostly Greensand, with mudstone on the bottom of the slopes. There are several pockets of glacial materials overlying the greensand. Topography: The end of the Greensand Ridge, undulating foothills around Great and Little Brickhill. The western slopes around Bow Brickhill are very steep and the highest point is 180m at Bow Brickhill Heath. Heathland – There are areas of heathland on Rammamere Heath and remnants of heathland vegetation can still be found on Bow Brickhill Heath and in some areas of plantation woodland. Acid Grassland – There are areas of acid grassland in association with the areas of heathland. There are extensive areas of semi-improved acid grassland throughout the Brickhills. Fen/ Purple Moor Grass and Rush Pasture – There are wet flushes in both the foothill grasslands and in the plantation woodlands. Hedgerows – Many of the enclosures around the Brickhills are pre-18th century and may have species rich hedgerows associated with them. Lowland Meadows – There are areas of marshy lowland meadow to the west of Stockgrove Country Park. Ponds – There are ponds associated with seepages. Wood – Pasture & Parkland – there is parkland at Stockgrove House. Woodlands – Most of the woods on the ridge plateau are coniferous plantation. Dunscombe wood is mixed conifer and broadleaved. Danesborough Hill Fort is an SAM. There are a few fields of surviving Greensand Ridge and Furrow. Parts of Rammammere Heath SSSI are accessible.